"The hotel accommodated us by giving us two rooms with ocean..."
Have a question for Serene Beach Hotel? "Rooms are comfortable, clean and staff are very helpful and attentive." "Only got to stay one night but the place was awesome, very clean beach across the road." "Spent most our time at the pool with amazing view and friendly atmosphere." 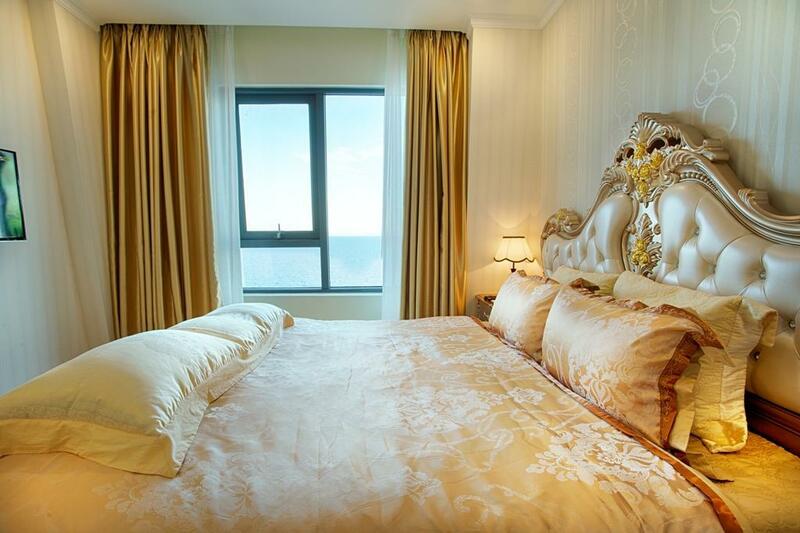 "The seaview from the beach-facing rooms was great." Located on My Khe beach, one of the most beautiful streets in Danang, Serene Beach Hotel has been designed to adopt the shape of a yacht tower, with 16 floors featuring 140 rooms and suites. All of the units are well-equipped with modern and luxurious facilities that follow the 4-star standard guidelines to ensure you with maximum comfort. Serene Beach Hotel is only a few steps to the crystal-clear blue water. Serene Beach Hotel also offers many facilities to enrich your stay in Da Nang. Numerous on-site facilities are available to satisfy even the most discerning guest. Besides, its host of recreational offerings ensures you have plenty to do during your stay. 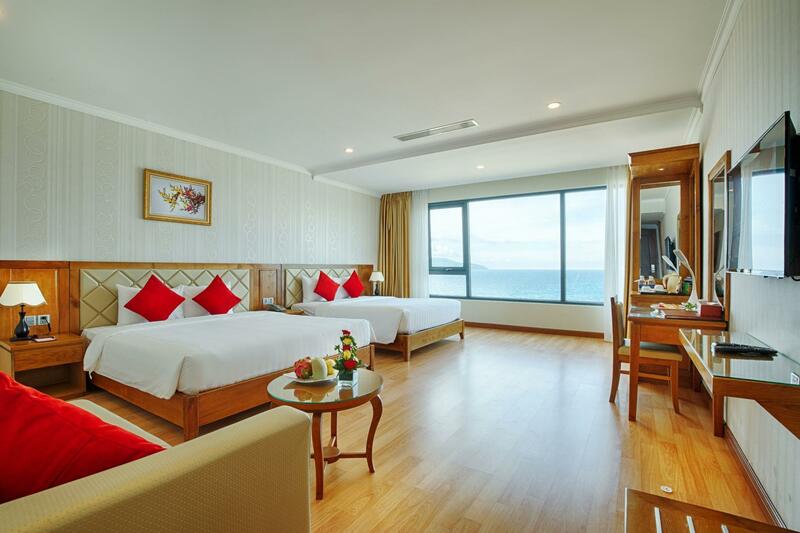 Serene Beach Hotel is surely a smart choice for travelers to Da Nang, offering a relaxed and hassle-free stay every time. Children 6-11 years old will be charged VND 130,000 per child per night when using existing bedding (breakfast included). The Hotel staff prepared a little birthday surprise for my partner foc, thanks! It has a great view and very clean room, fair price if compare to its neighbor. Only got to stay one night but the place was awesome, very clean beach across the road. Spent most our time at the pool with amazing view and friendly atmosphere. Ate lunch and dinner there, the meals are big and very well cooked. Staff at the bar are all friendly. Thanks! Room is comfy and pleasant. Decent and clean. Staff - friendly and helpful in my needs (i.e. assist in talking to cab driver since cab operator had a bit difficulties in understanding english). Breakfast - It was just decent and good. Pool - Fantastic View Overall - If you are looking for beach view and comfy stay, you can consider here. We had booked 2 rooms, one via Serene Website and one via Agoda. My advice do not book via their website. An assumption was made that we had double booked due to the fact we booked the second room on their website at a later date and as result even after phone calls and emails our second room was cancelled. So on arrival we found out we only had one room. So instead of staying 4 nights we could only stay 1 as hotel was totally booked out. The hotel room was very clean with good amenities and had a beautiful view across the beach and bay. Restaurants close by are not fantastic so may need to taxi it depending on what you were wanting to eat. Breakfast was good and well stocked. Great location with beautiful beach right in front, close to the city, nice restaurants close by. Very friendly staff, very big breakfast buffet with Asian and Western options. Room ok. WiFi very- very slow in the room, OK in the restaurant and reception. Nice pool. Dear Sir/Madame thank you very much for staying with Serene Danang. We hope to see you again. We stayed here a couple weeks back. We had booked one room over two nights however could only stay one night. The hotel accommodated us by giving us two rooms with ocean views. Thank you for doing so. Very friendly staff too. Dear Sir, Thank you for choosing Serene Da Nang Hotel. We are very happy when you have a good experience with Serene and give us great comment. your compliment is a motivation for us to improve our services. I’m Asian too, but there’s only so much of the mainland Chinese tourists’ behaviour that I can take. Yelling/speaking loudly in the hallway regardless of time (6am or 10pm), pushing in for the elevators (only two lifts and they were always both going up or down); grabbing food at the breakfast. Hotel staff had no initiative nor desire to be there. No towels at the pool? I was told to go back up to my room and get my towel from there. No more food at the breakfast buffet (even though it is only 9am)?? Shrug and walks off. Communal tea pot had tea so thin, it didn’t even taste like tea haha. If you’re looking for proximity to beach, this has it but is not worth it. Very dates furnishings in the rooms and foyer. Never again. hotel is located in front of beach. room is clean and comfortable but not good view, facing construction site. bed was very hard. swimming pool was nice but needs updating and cleaning. not really good service but I think this is standard of da nang. breakfast was very basic and sorry to say that taste was below average. high rise hotel next to this hotel was 5 star with roof top bar but service was quite similar. so that makes this hotel was good value for money. the serene hotel give me upgrading room more than reserved room. And when i had required high floor and beautiful view, they were accepted my suggestion. Not to impress with breakfast options. Love their pools , recommend to take sea view room ,breakfast is not much choice to get. we visited there last week. hotel is soso. staff is polite but not 4 star hotel standard. Everything was normal, welcome drink was just normal tea and they forgot giving us until i asked receptionist. in my opinion, it's 3 star hotel. A perfect step away from the front door to the beach, this clean and modest hotel is in a great location. Interior is simple but well suited for tropical housing, clean and well kept. Staff were helpful and friendly. Dear Sir, Thank you very much for your great review. It is our pleasure to serve you and your family. Your compliments are motivation for us to move forward for beteer service. Thank you for choosing your stay at Serene Hotel. Located right in front of the gorgeous My Khe Beach, the hotel seemed very promising ( it being newly built and four star hotel). Too bad there were too many flaws. stayed there four nights, had to suffer from other guests yelling on the hallway ( or kids playing) the whole time. when complained about this to the front desk, they said they will take care of it but did that ever happen? NOPE. couldn't sleep well either day or night. The swimming pool was full of kids spraying water all over the place, no space to relax. the main reason I chose the place was because of the swimming pool but ended up spending day after day at the beach (which I loved). The staff seemed like they could only answer to the guests according to a manual. super impersonal and hard to communicate. The fridge in the room was not working well and no ice machine on the premise. I loved Danang and Hoian but this is a hotel that I would never go back. to the management: Noise Control, please!!! the way hotel organizes air conditioner is so bad, my kid nearly got cough after only one night. the wood floor was not clean. The bath room was not all covered by grass, after bathing water flood bath room. The rooms are comfortable but the hotel is totally lacking in atmosphere. The service is friendly but communication in English was challenging. The seaview from the beach-facing rooms was great. Staff not friendly. Location a bit far from everything except the secluded part of beach across the street. Thank you very much for your feedback. We appreciate your review. Thank you very much for your feedback. We appreciate very much your review.